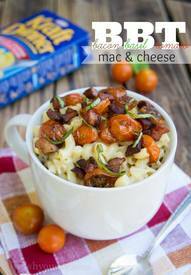 This Bacon, Basil, Tomato Mac and Cheese is delicious. If you’re like me, you might have a loads of tomatoes from your garden and looking for ways to use them up. We planted 4 cherry tomato plants this year, and that was 3 too many. I’m up to my eyeballs in tomatoes.